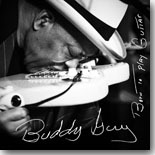 If you�re a fan of Buddy Guy, you will find a lot to enjoy with his new release, Born to Play Guitar (Silvertone/RCA Records). No album has ever been more appropriately titled as Guy and longtime collaborator Tom Hambridge have joined forces again to offer up 14 sizzling tracks that showcase the man and his Stratocaster, along with a host of guest stars that includes ZZ Top�s Billy Gibbons, Van Morrison, Kim Wilson, and Joss Stone. Wisely, Hambridge plays to Guy�s strengths on these tunes, but throws in enough twists and turns to keep your attention. There�s plenty of string bending going on with tracks like the title tune, �Back Up Mama,� �Turn Me Wild,� and �Whiskey, Bear & Wine,� but there are also a few curves thrown in. Guy�s duet with the young British R&B vocalist Joss Stone (�(Baby) You�ve Got What It Takes�) is marvelous. Their voices complement each other well and the lush strings are a change of pace for a Buddy Guy release. Elsewhere, there�s a stirring tribute to B.B. King, �Flesh and Bone,� that pairs Guy with Van Morrison, and harmonica master Kim Wilson teams with Guy on two tracks (the classic �Too Late� and �Kiss Me Quick). These tunes will remind longtime fans of those fabled Buddy Guy/Junior Wells collaborations. ZZ Top front man Billy Gibbons joins Guy for the scorching Texas-styled rocker �Wear You Out,� and Guy pays tribute to his mentor on the acoustic �Come Back Muddy,� backed by Reese Wyans� piano and Doyle Bramhall II�s 12-string. Hambridge wrote or co-wrote 13 of the 14 tracks on Born to Play Guitar and obviously his lyrics speak to Guy, who sings them as if their his own words. Guy did actually co-write a few of these with Hambridge (�Whiskey, Beer & Wine,� �Turn Me Wild,� �Crying Out of One Eye,� �Crazy World,� and �Thick Like Mississippi Mud�), but it�s clear that this is a collaboration that�s build to last. Through it all, Guy performs with an intensity that belies his 79 years, both vocally and on guitar. Born to Play Guitar is one of Guy�s best in recent years and it�s strictly Buddy Guy doing what he does best and loves the most�..playing classic blues guitar in his own inimitable style. No album was more appropriately named than this one.